If you're a foodie, you must have tried spicy recipes. Chilies are an important part of almost every cuisine. Some of us like low to moderate level of spices, while others just love extremely spicy food. I myself enjoy some of the spiciest dishes. There are over thousand varieties of chilies and each one of them has a unique taste. Some are sweet, some are relatively less spicy, and some are absolutely hot. I've compiled a list of some of the hottest chili peppers on the planet. Be careful while using these fiery chilies in your recipes. 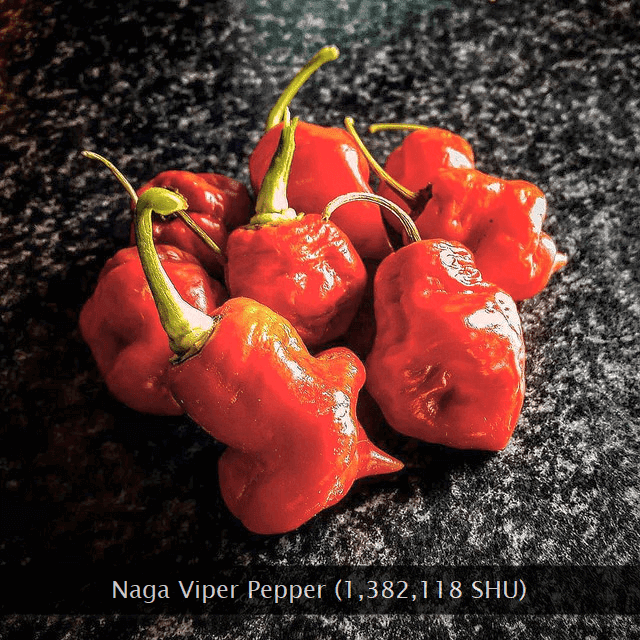 For example, the very small increment in the quantity of Naga Viper chili can make the recipe, extremely spicy. My personal favorite is habanero chili. Let's check out these hot chilies. Note: Some of the chilies mentioned in this list should be used with utmost care. Failing to use the highly moderated quantity of these chilies can spoil the entire recipe. The heat (spiciness) of chili peppers is measured through Scoville scale. 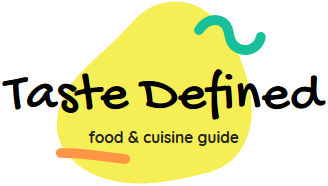 The metric is commonly known as Scoville heat units (SHU) to know how fiery, a chili is! In fact, a good number of these chilies may not be readily available in your local vegetable market. Still, having a knowledge of these hottest chili peppers is recommended for recipe developers and die-hard foodies. 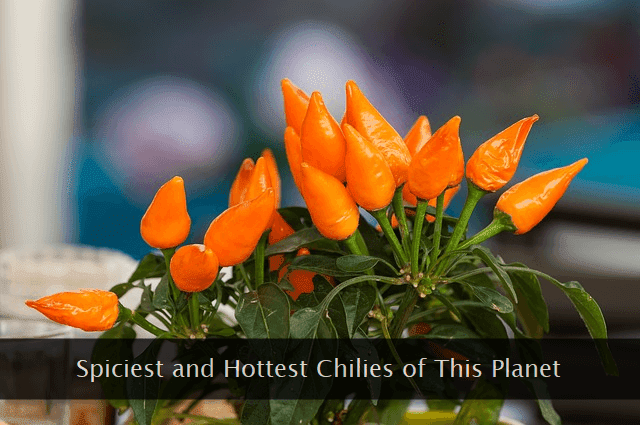 It's time to know all about the hottest chili peppers available for our taste buds. The list given below enlists these pepper in the decreasing order of their spice index. In other words, the hottest pepper is at the top and the mildest one is at the bottom of the list. 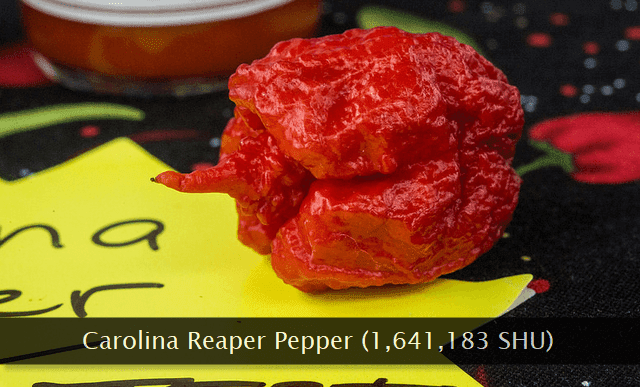 Carolina Reaper is the deadliest one in this list. While handling the ripe pepper, use hand gloves else you'll regret your decision of not using one. It's a hybrid of Bhut Jolokia and Red Habanero peppers. 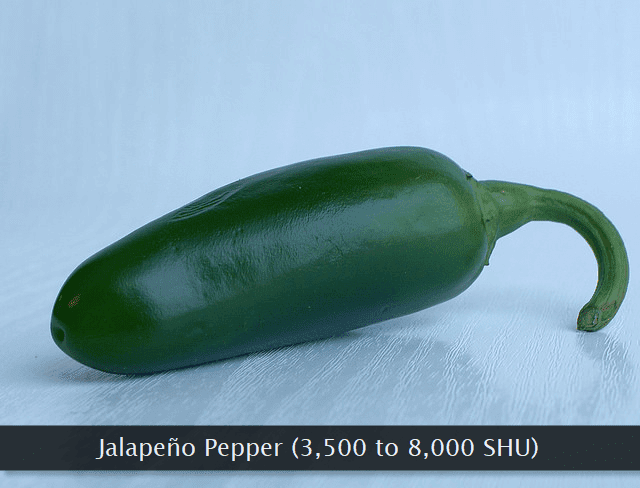 The average heat index of this pepper goes up to 1,641,183 SHU. 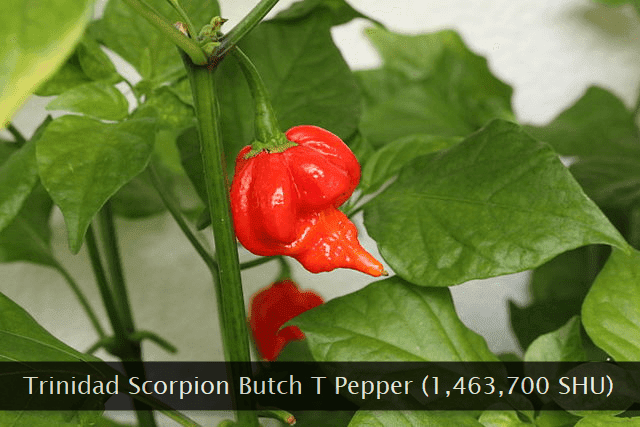 Trinidad Scorpion Butch T is the second hottest pepper in this list and is widely known to be fiery on taste buds. It is derived from the Trinidad Scorpion pepper. Its pungent flavor and the pointed tip makes it unique. The average heat of this pepper is 1,463,700 SHU. Komodo Dragon chili pepper exhibits a truly unique delayed reaction on the taste buds. Initially, it gives a nice fruity heat and after a few seconds the fiery flavor explodes within entire mouth. 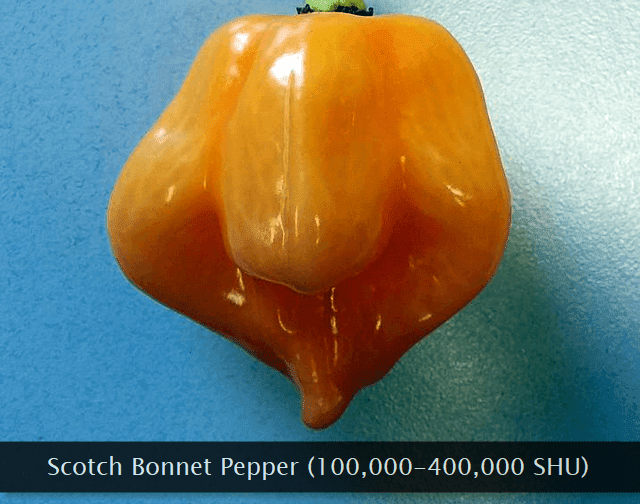 The average heat intensity of this pepper hovers around 1,400,000 SHU. Naga Viper pepper is yet another fiery and hot chili capable of easily blowing out your senses if kept on the taste buds for a few seconds. It can be easily grown in a kitchen garden having moderate sunlight. The heat of this fiery chili can go up to 1,382,118 SHU. 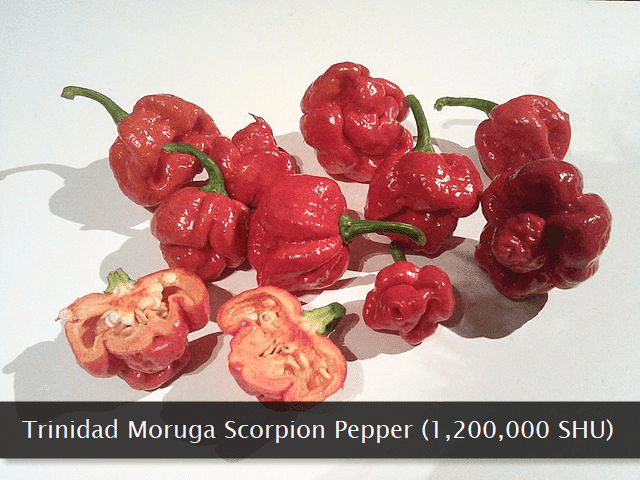 Trinidad Moruga Scorpion pepper is known to combine a nice fruity and hot flavor which makes it ideal for use in several recipes. It can be grown in most parts of the world where extremely cold weather doesn't exists. The average heat of this chili is 1,200,000 SHU. Peach Ghost Scorpion pepper gets an ugly shape as it ripes on the plant. It also gives a hint of floral and sweet flavor on the taste buds. 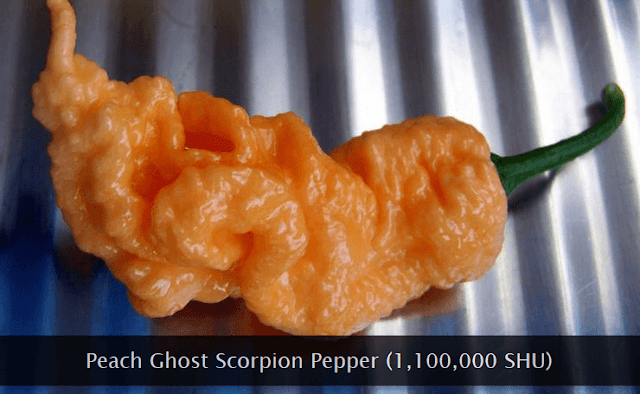 It's a cross-breed of Bhut Jolokia and Trinidad Scorpion. 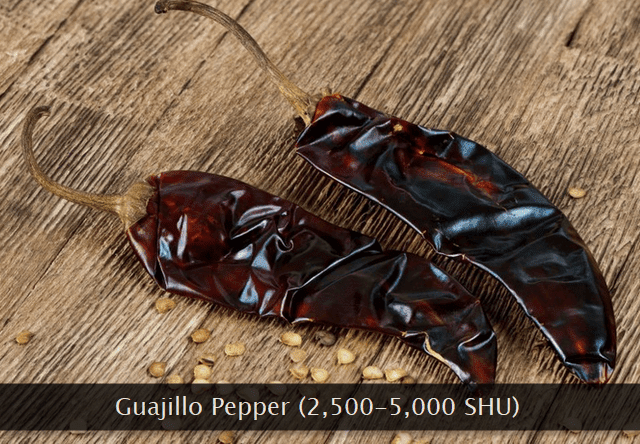 The average heat intensity of this flavorful pepper scores at 1,100,000 SHU. Bhut Jolokia pepper is of Indian origin and is known to be one of the most popular hot chilies available around the world. The heat distribution is throughout the fruit instead of just in the placenta. The average heat intensity of this chili ranks at 1,041,427 SHU. 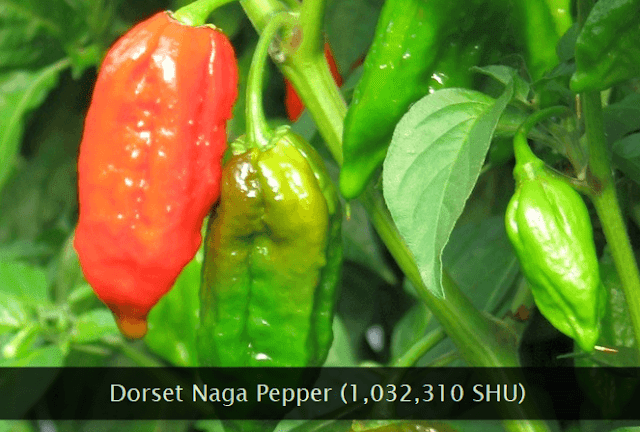 Dorset Naga pepper deserves a place in this list due to its fiery flavor. It is derived from Naga pepper variants found in Bangladesh. Its heat changes sharply when the fruit ripens on the plant. The heat intensity of this extremely fiery chili is around 1,032,310 SHU. 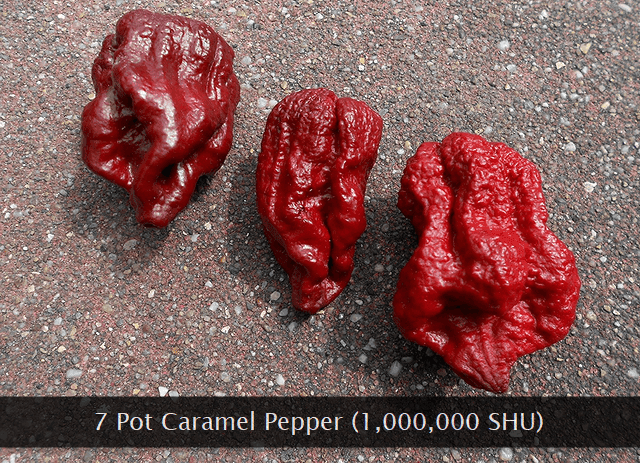 7 Pot Caramel pepper comes in various shades and burns taste buds like hell. Though hot, the peppers taste really good and are ideal to be used in a dried form. It's my favorite chili in this list. The average heat scale of this fiery chili pepper is around 1,000,000 SHU. 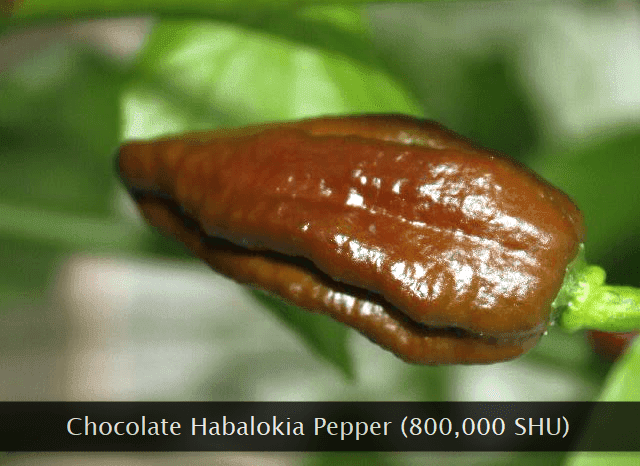 Chocolate Habalokia pepper is a hybrid of Habanero and Bhut Jolokia. Its heat spreads rapidly on the tongue giving an intolerable sensation. When ripe, it gets a nice chocolaty and brownish color. The average heat intensity of this flavorful pepper is 800,000 SHU. Red Savina pepper is a comparitively large fruit with a thick skin wall. It has a distinct flavor which makes it stand out from the rest in this list. It held the record for the longest period of time. The heat intensity of this pepper scales up to 350,000-577,000 SHU. Scotch Bonnet pepper is from the Caribbean Islands and tastes extremely fiery on the taste buds. It is widely used in condiments and sauces across the world due to its flavorful texture. 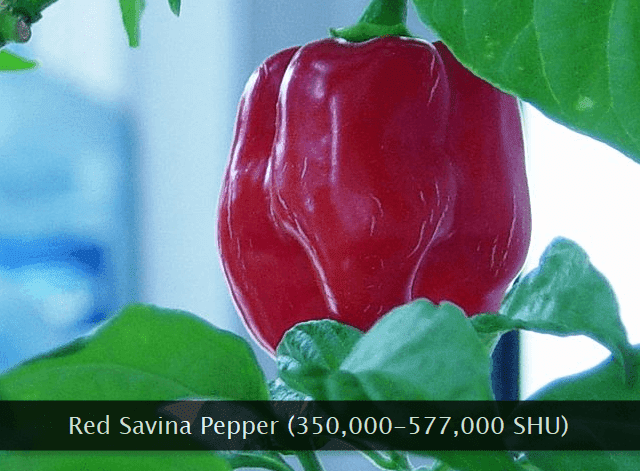 The average heat intensity of this pepper lies between 100,000-400,000 SHU. 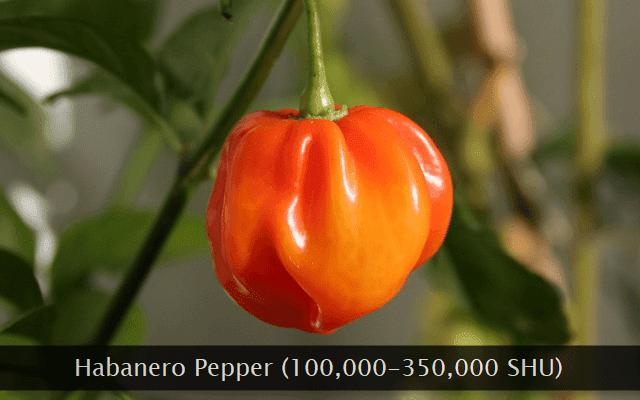 Habanero pepper is available in various colors but the most prominent among them is the orange-yellowish tint. Its nice flavor and floral aroma makes it an ideal choice for sauces and fiery recipes. The average heat of this chili can lie between 100,000-350,000 SHU. 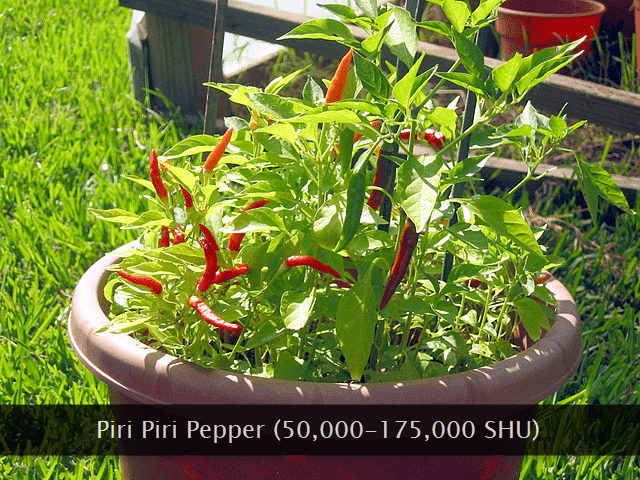 Piri Piri pepper which is also known as bird's eye chili is often used in our kitchen in powdered form. 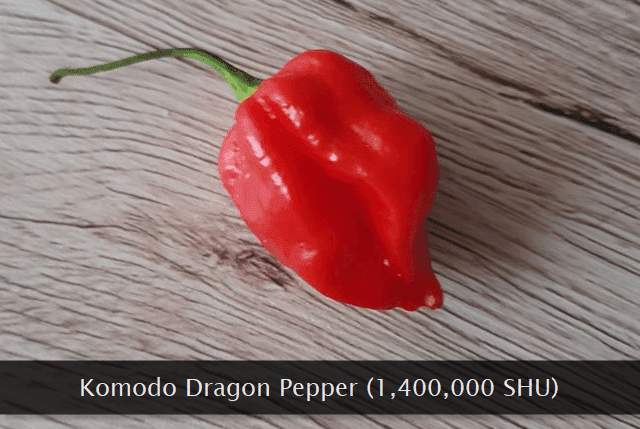 Though it ranks low in this list, the heat of this pepper lasts for a long time on the taste buds. The average heat intensity of this chili is 50,000-175,000 SHU. Tabasco pepper is widely popular around the globe due to its use in a sauce. It is also used in flavored vinegar base. It can be cultivated easily in moderate weather conditions. 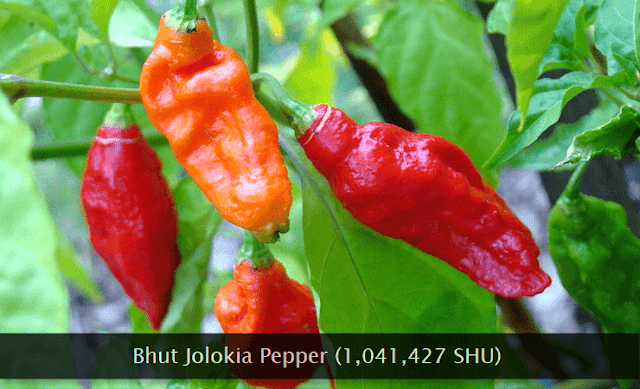 The heat intensity of this famous and widely-used pepper is around 30,000-50,000 SHU. Jalapeno is a Mexican pepper I love to use in my recipes. It is widely used in a pickled form and is also used in jellies. While using these hot chilies, make sure your hands do not touch the eyes. 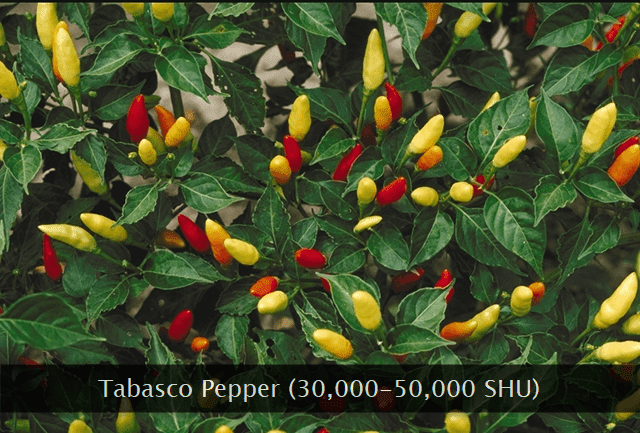 The heat intensity of this pepper ranges between 3,500-8,000 SHU. Guajillo chili is primarily used in a dried form. It is often used in salsa and sauces. It is also used to flavor dips and spreads. I often soak this chili in water before using in a recipe. Always remove seeds before using this chili. The heat of this chili is 2,500-5,000 SHU.